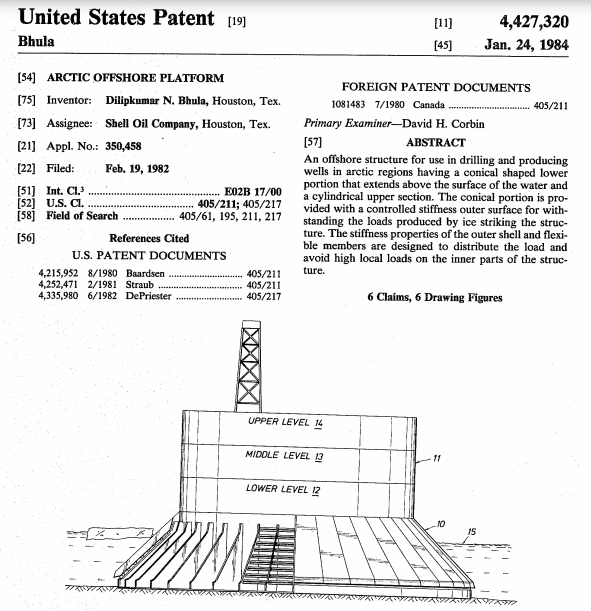 This 1984 patent filed by Shell Oil Company for an Arctic offshore drilling structure is part of a larger collection of documents assembled by the Smoke & Fumes project of the Center for International Environmental Law. The patent demonstrates Shell’s efforts to fortify its offshore platforms for extreme ice flow in the Alaska region. Based in part on Shell’s understanding of increased ice melt and changes in mass due to climate change, this patent shows how the company was preparing for its operations despite the known risks. Shell continued to develop Alaskan reserves extensively from the 1980’s until the mid-2000’s, hiring expert climatologists to help them more accurately predict changing season lengths and seasonal ice severity in areas for potential drilling. This patent complements a larger collection of Shell documents which show Shell to be strengthening their interests in the Alaska region and actively preparing for the anticipated effects of climate change, while obscuring such information from the public and engaging in an ongoing campaign of institutional denial.